Enjoy delicious drinks, smoothies and more with the NutriBullet Nutrition Extraction System, the Super Food Nutrition Extractor. The Nutribullet is unlike everyday juicers and blenders, it completely breaks down ingredients in to their most nutritious, most absorptive state. Turn ordinary food into nutrient-dense drinks or snacks with this NutriBullet system. Its powerful 600-watt motor with cyclonic action effortlessly breaks down stems, seeds and skins to extract the nutrition that is often left behind in blenders or juicers. Reap a variety of health benefits when you use this revolutionary NutriBullet system. I am a long time smoothie fanatic. I drink smoothies for breakfast or after a workout. If I need an extra boost of energy, smoothies are my go to drink. I like green drinks but it's hard to get the perfect green drink, especially if you don't have a juicer + blender. Juicers take out the fiber and blenders leave chunks, but with the NutriBullet I don't have to worry about loosing Fiber, which is important to me and I can say goodbye to those chunks of fruit/veggies! The NutriBullet comes with a great recipe book that gives you all types of healthy drinks and smoothies. If you are trying to lose weight, then this is excellent for that too. Many people are drinking healthy smoothies and drinks and dropping weight in a healthy manner. You are getting the vitamins and nutrients your body needs when you are on a diet and losing weight at a healthy way. The Nutribullet will replace your current mixer and blender as it does a much better job than these two appliances together can do. The twelve pieces that the blender/mixer comes with is one flat blade, one emulsifying blade, two resealable lids, one tall cup, two short cups and recipe booklet along with a pocket nutritionist. You could never get these twelve pieces with any blender or mixer you purchase. The Nutribullet is compact and lightweight. You can take it with you on vacations or to work. There isn't anywhere you can't use it. The price is amazing as well. 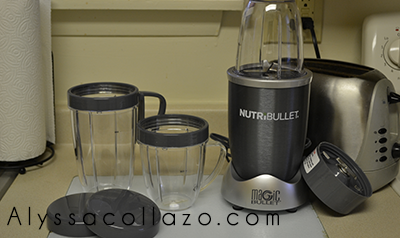 You will spend less on the Nutribullet, but get more than you would from a juicer, blender, mixer and shake maker. These four appliances can cost you hundreds of dollars and you can get the Nutri-bullet for ¼ the cost. Here is a quick, easy and delicious energy boosting smoothie recipe made with fresh fruit, kale, greek yogurt and milk! A Berry Kale Smoothie! Easy and so good! So good in fact that I drank both portions and the only reason I knew the kale was in there is because I put it in there, could not taste it at all! Now its YOUR turn to try the NutriBullet! 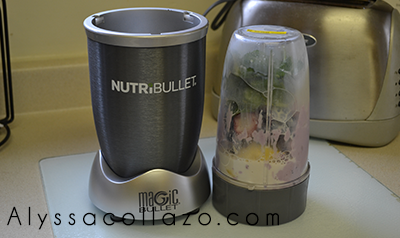 NutriBullet is giving ONE of my lucky followers the chance to win this amazing Nutrition Extraction System! Good luck everyone! One (1) winner will receive: The NutriBullet. Ends 10.31.14. DISCLAIMER: All products received are complimentary for testing purposes from NutriBullet. All opinions stated are my own and are not influenced by any affiliates. I love that it completely breaks down ingredients! There is nothing worse than a chuck of something or other in your smoothie! I have heard so many good things about the Nutribullet. I totally want one. I think I would use it all the time. I just love that you can make so many great smoothies. I just love making smothies! Love that you can break down ingredients and include them in smoothies! That's awesome! I am not a fan of kale, but perhaps I would drink it if I couldn't really taste it! I like the fact that you mix it and drink it in the same cup, so no extra clean up. I like that it really BLENDS the ingredients... you don't get those chunks of random ingredients like you do with an average blender. What a great giveaway! I love my bullet! I make salsa and coffee drinks in it! I like the quick energy and protein you can get from a smoothie after a workout. This looks like a nice machine. That it makes eating healthy easier. That you can make anything from a smootie, to chicken salad to a mixed drink. And it doesn't take up anymore room on the counter than a roll of paper towels! I love that it's small and compact and doesn't take up so much space as the big blenders. I need this, I like the small discreet size so that it doesn't take up a lot of space. Smoothies are so expensive here in San Francisco, it would be more economical to do it at home! 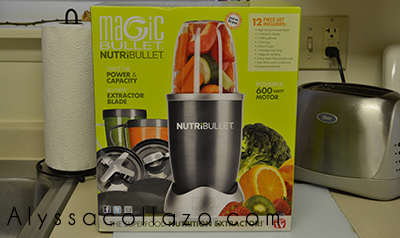 I like this product.. i am not a juicer but this is such a multifaceted machine that we can use it for many things. I love that it thoroughly blends and mixes all ingredients so well! I'd love to have one of these bad boys especially with my diet it'd be great to win! I have heard so many things about the nutribullet. I Would love one for my smoothies. I like that it is smaller than a standard blender -- much easier to store. We recently got a Nutria Bullet and we love it. I make smoothies in it and I also make almond flour for cooking. I want one of these so bad. I would be a smoothie addict if I had one! I like the size of this, I bet it makes great smoothies. What a great giveaway! That's a decent size that would be great for me. What concerns me most about these thing sis the sound they make though. Nutribullet spells convenience for me. It looks sleek but at the same time it's very functional and would definitely be a nice thing to have in the kitchen. Good luck to all joining! I think this kind of products are best to those who love making smoothie everyday. Perfect gift for Christmas to our friends I guess. I like that it doesn't take up a lot of counter space and could be portable. I'm sold! I love smoothies. This would save me space, preparation and clean up time too! What a fantastic gadget! It's definitely perfect for smoothies! I love that it packs each drink made with vitamins and nutrients that are easily absorbed into the body. I've wanted one for a while now. Finger's crossed. Finger's crossed!! I've been wanting one of these for sooo long!! I love that the Nutribullet will replace your current mixer and blender as it does a much better job than these two appliances together can do. That it's so powerful. I'm a daily smoothie drinker and would love this. My son and his wife have a Nutri Bullet and they love it. I think it could come in hand in so many different ways. It's small, and looks easy to operate, and especially clean. That's what I like about it. I've been seeing this around a lot lately. They look really nice. I'll to get one. This is so cool! I have always wanted a NutriBullet. I make a lot of kale smoothies in my blender, but the NutriBullet just looks so dang powerful. I need that kind of power in my life. Would make getting my burst of nutrients first thing in the morning so much easier! I have always wanted to try this! So cool! I like how portable it is and convenient to use. I like that it is small yet powerful and you can drink straight from the blender cup! 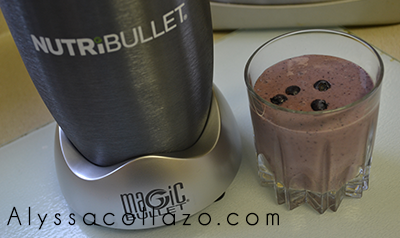 The Nutribullet is such a cool device! I want to get my husband one for Christmas! I'd love this. It's so much more convenient to take along than my blender. I love the compact size! i like that you can mix it and take it to go in the same cup. so easy. we had one of these at one point, but it got lost or who knows. I've always meant to get another. These are awesome for shakes of all kinds. It is so easy! The cleanup is a breeze. I like the size of it. It's easy to store and bring with you places. I love how easy they are to clean! I've always loved how small and compact it is! I love that it comes with different cup sizes. Quick and easy smoothie meals for one. I like that I can make some nutritious food and drinks without any waste. I like that it breaks down stems ans seeds. I love how quick it does its job! I like that it's so much easier to use and to put together than my old outdated blender. I make smoothies every day. I love that you can make so many different items in it and not just juice. These reviews are so helpful dear. I found this product really good. Actually I have decided to start drinking the Green drink everyday but I need juicer to make that. So I am definitely going to buy this one. It is so great. I'm so satisfied with the blender.